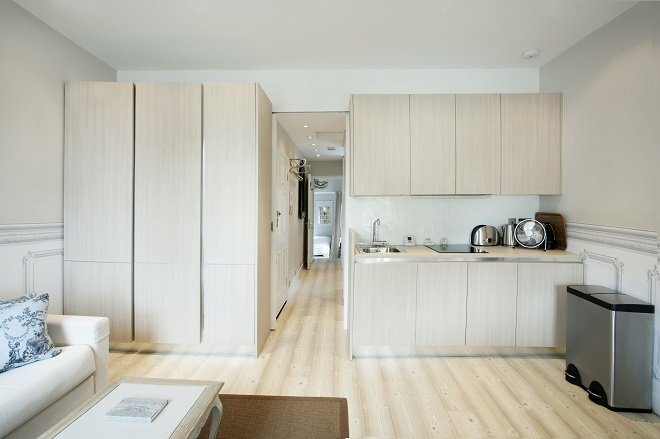 For business or for pleasure, a stay at our Addington apartment is the perfect base for your London visit! This contemporary two bedroom apartment is located in the much sought-after west Chelsea neighborhood, and is perfectly located to explore all that the city has to offer. 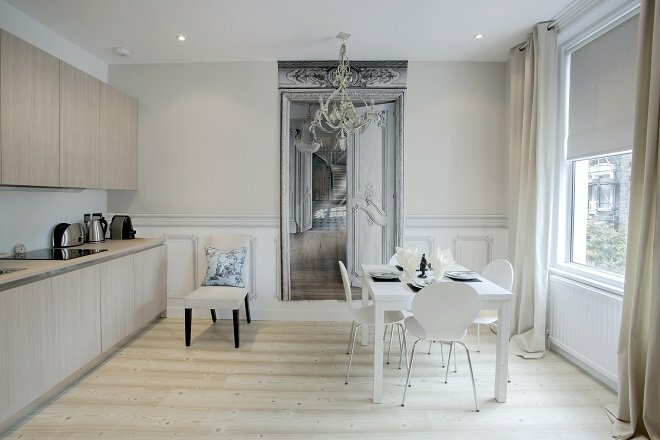 Our beautiful new Addington apartment is available for long-term stays – now at an amazing reduced rate! For bookings of 4-8 weeks (56-62 nights), the Addington is available for only £1100 per week. For bookings of 9 or more weeks (63 nights +), the rate drops to only £1000 per week. These rates include utilities, 2 cleanings per month and starter supplies. Contact Us to find out more about this incredible offer! The bright and stylish décor is sure to delight you and your family whilst on your stay. The open plan living/dining area is the ideal place to feel at home, and the spacious living area is perfect to enjoy the company of family, and enjoy a meal after a busy day of seeing the sights. 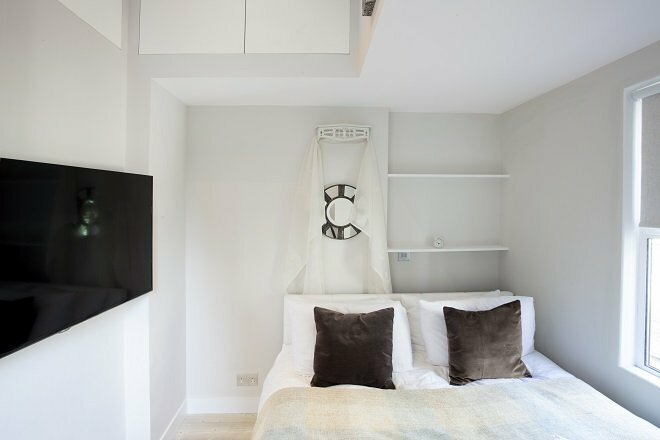 As you explore the apartment you will be delighted by the two modern bedrooms which have been decorated to ensure a comfortable and restful nights’ sleep. The bright and inviting bathroom benefits from a marble-lined shower, as well as a rainforest showerhead. The Addington is perfectly equipped throughout to ensure your stay is a relaxed and comfortable one. 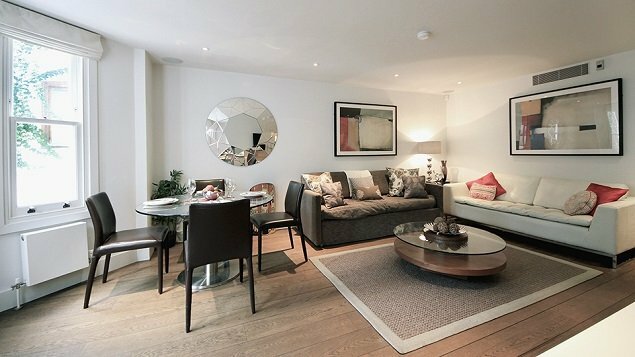 The location of the Addington is also one of the very best, not only for its exclusivity, but also for its excellent transport links. For long-term business stays, this is the ideal base to get to the central business locations with Earl’s Court tube station providing you with speedy access via the District line which can take you into the heart of Westminster. You are also on the best line for a direct route into Cannon Street which is ideal if you have meetings in the financial and banking district. 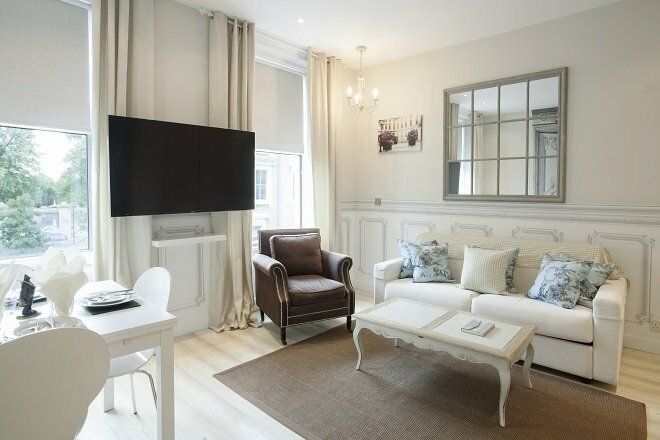 After a busy day, you can then head back to your apartment to relax and unwind, and even start to think about planning some exciting days out! As the location of the Addington is ideally placed for seeing the best that London has to offer, you can easily access the top exhibitions and art collections at the world-famous Museum Row, as well as the boutiques and first-rate shopping around South Kensington. You will also benefit from the charming traditional pubs and well-renowned restaurants in the surrounding area – ideal after a busy day of work, or indeed, sightseeing! For our guests who are looking for that long-term rental to suit their travel and business needs, we will ensure you have a comfortable and happy stay with us. Contact Us to book your stay at the Addington! Posted on Tuesday, August 18th, 2015 at 10:32 am in Apartment Rentals. You can follow any responses to this entry through the RSS 2.0 feed. You can leave a response, or trackback from your own site. Long-Term Stays Now Available at the Stunning Gladstone Apartment! 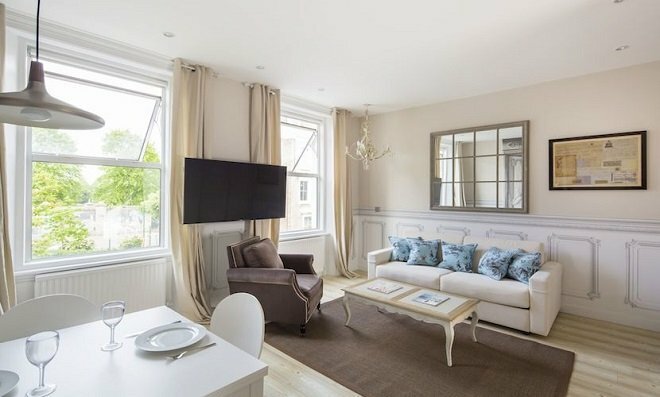 Introducing the Beautiful New Addington in London Long-Term Stays At The Stunning Austen Rental Exclusive Limited Time Offer for Vacations with Italy Perfect!